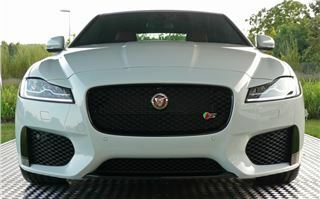 In my mind the new 2015 Jaguar XF has a hard act to follow. 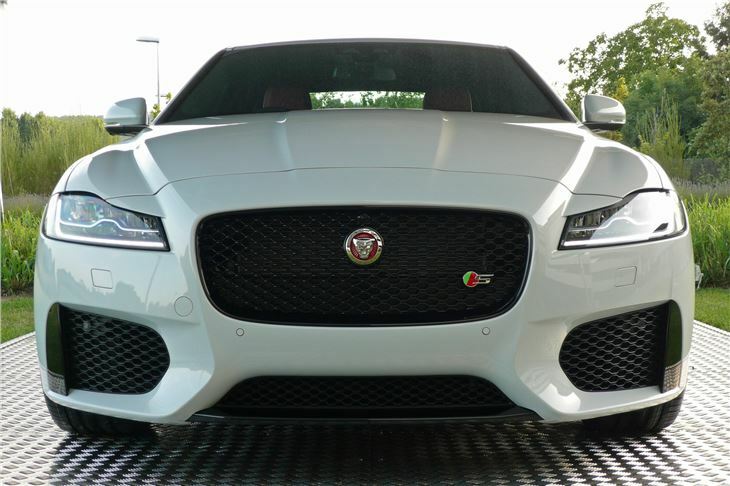 I loved the original XF in almost every incarnation, from the 4.2 V8, through the 3.0V6 diesel and 5.0 litre V8s, to the fire-breathing 550PS XFRS. 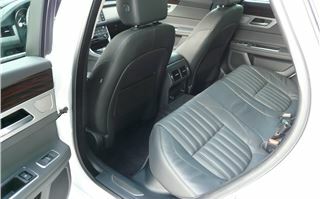 The new car is shorter, yet sits on a longer wheelbase, so is better balanced and roomier inside. The styling is more integrated. According to head of design, Ian Callum, they started at the front, took a long time to get that absolutely right, then added the new longer wheelbase, and built the car from there. 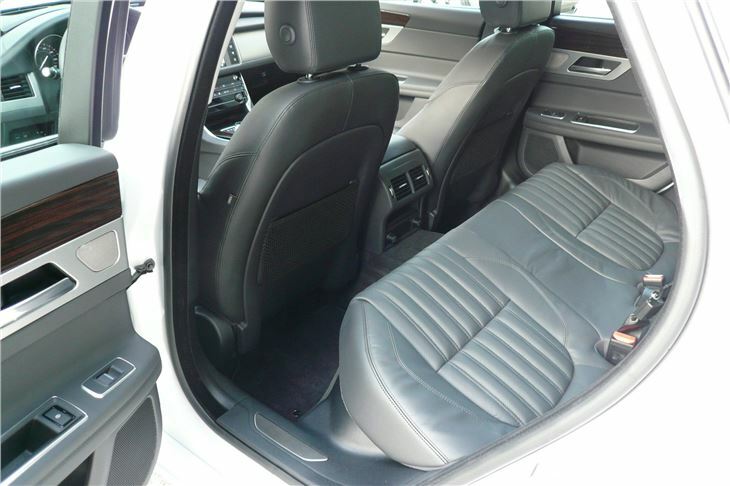 It has a pronounced high shoulder running front to back just below the window line, and a short swage line from the side air-vent that disappears into the door, like an airplane contrail, giving an impression of speed even when the car is standing still. 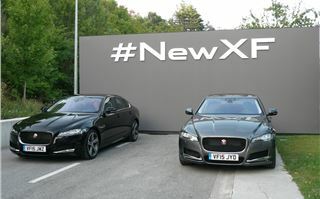 Unlike the previous steel-bodied XF, the new car is mostly aluminium pressings and castings, with magnesium boxed sections at the front and under the windscreen, boron steel B pillars and cabin cage, and steel subframes for the engine and front and rear suspension. 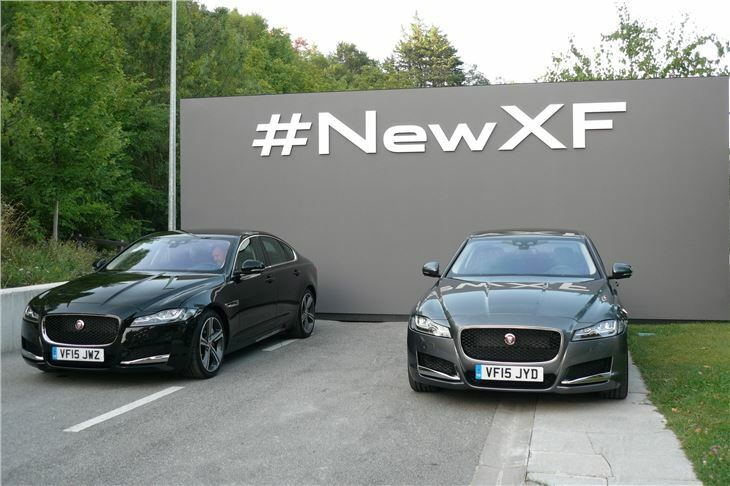 It is 135-140kg lighter than the previous XF and only 75kg heavier than the smaller XE. Inside you get a completely updated control centre, under a similar ‘Riva hoop’ to that of the XE that curves over the instruments and dash-top from the doors and makes a boring part of any car interior into an interesting one. 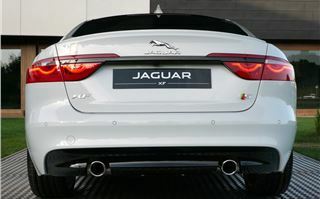 These days, in any modern car, connectivity is the key and Jaguar takes this several steps further than most with a special aerial fin that turns the interior of the car into a wireless hotspot, boosting signal strength to a level otherwise unknown for portable ‘devices’. 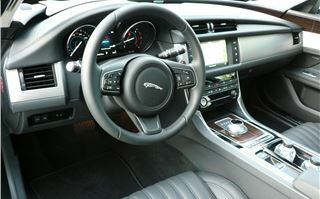 They call the car’s own touch-screen operated system ‘In Control Touch’. 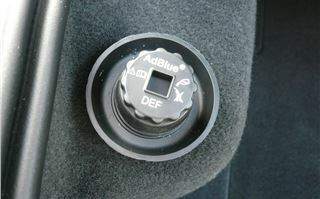 It enables you to alter the car’s settings, heat it up or air-condition it, and even start the engine from a smartphone. Not only that, you can track the car’s position from a smartphone anywhere in the World, so if someone somehow managed to steal it from an airport carpark in the UK while you were in Tokyo, you could alert the authorities and even shut down the engine. You can access millions of music tracks and talking books to load into the system and play back at will. A system called ‘Just Drive’ enables you to do all this and even receive and send ‘Tweets’ by voice control. ‘In Control Touch Pro’ enables you to plan a satnav route on a mobile phone then automatically loads it to the car, follow the route, and, if you are running late, automatically alert people to the fact. It learns your regular journeys, suggests more efficient routs avoiding traffic hold-ups, compensates for GPS blackspots caused by tall buildings or tunnels, can offer a panoramic view of your destination as you approach, and can feed your smartphone with a pedestrian route from a car park to your final destination. Other new features include an optional head-up display that shows the gear you are in, your speed in kmh or mph and the next satnav instruction. 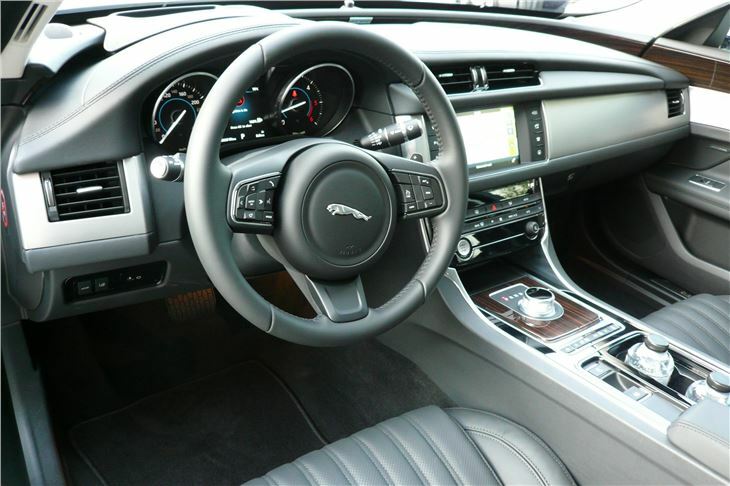 The instrument panel in front of the driver is configurable to give all that information too, in whatever relative sizes you want, so you can have big gear numbers or small ones, depending on what other information you require concurrently. 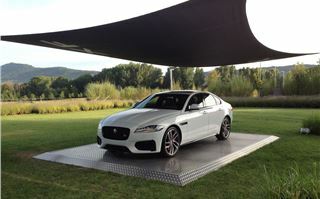 All new Jaguar XFs have ‘Sport-tuned’ passive damping. 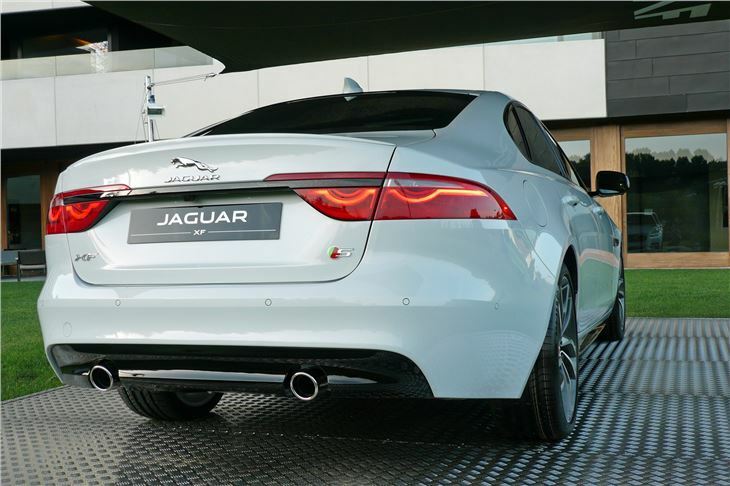 However, optional ‘Adaptive Dynamics’ enable the driver to configure throttle response, gearchange speed, damping and the degree of electronic stability control to his own preferences, depending on the stage and type of journey. ‘All Surface Progress’ enables the car to pull away and drive on a slippery surface without any throttle input from the driver. 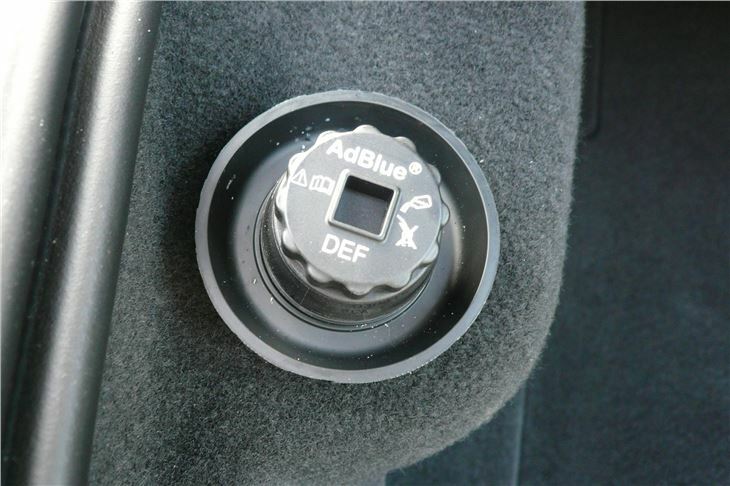 Cruise control and speed limiter work instantly at the press of a button. Traffic sign recognition warns you of traffic and speed limit signs, and you can even programme a voice to warn you when you are exceeding a speed limit. The electric power steering system reduces CO2 emissions by around 3% compared with an engine driven hydraulic PAS system. There was an embargo on driving impressions until Monday 17th August, so this bit was held up. But then Autocar and Auto Express broke the embargo on 15th August, effectively removing it. We drove the 2.0 180PS Ingenium diesel model with 8-speed automatic transmission and standard passive damping; the 3.0 litre 380PS supercharged petrol model both on track and on the road, and the 300PS/700Nm torque 3.0 litre V6 diesel on some spectacular mountain roads. 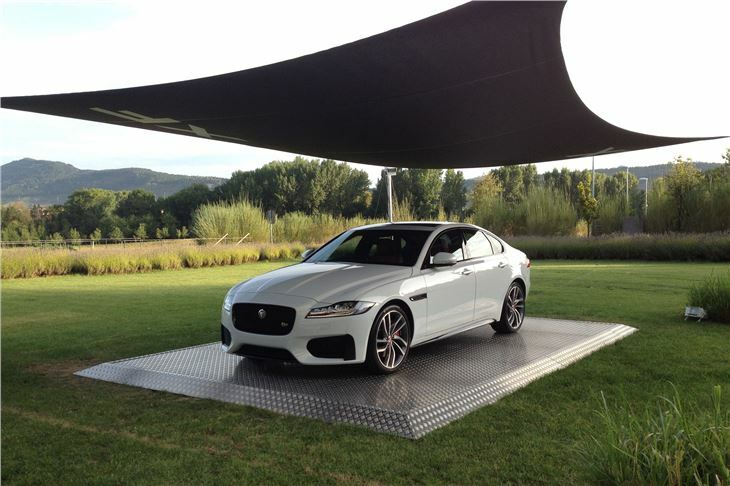 80% of Jaguar XF sales are expected to be diesel, and 80% of them with either the 104g/km 163PS 2.0 Ingenium engine or the 114g/km 180PS 2.0 Ingenium. 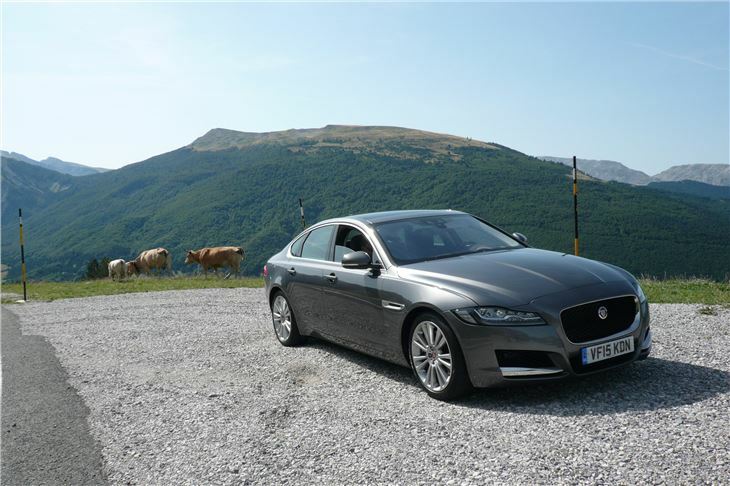 We had driven the 180 Ingenium diesel auto before in the XE, but in the XF it felt less lively, even though it was only hauling an extra 75kg along. It could be that the late delivery of its maximum 430Nm torque, from 1,750rpm accounts for this. Could be the gearing is higher in order to achived the low 104g/km CO2 of the 163PS version.I guess I’d get used to it after a few weeks and would learn when to paddle shift to help it along, but first impressions were not overwhelming. Next, it was the track. The same Circuito de Navara on which we’d driven the 340PS supercharged XE 3.0i S/C, but this time the 380PS XF with 40 more horsepower to overcome 45kg extra weight and the same 450Nm torque. 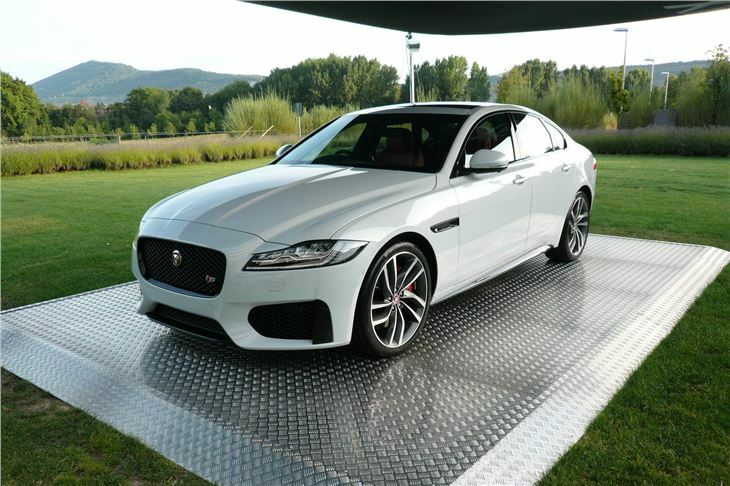 This is an easier car to drive quickly on a track than the XE because it has a longer wheelbase and slightly better weight distribution. Consequently, after a mistake that disabled the DSC, I was able to get it round the circuit at a reasonable amateur pace with the DSC switched off entirely. Even I could actually play with this car, moving the back or the front a little bit, but always confidently in control. 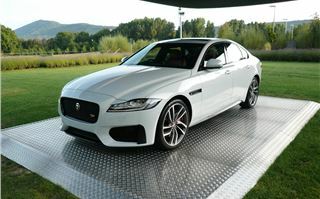 There will be more powerful XFs later, and a four wheel drive version, but so far this is the XF for driving on business that’s also plenty of fun on a track day. After that, we drove another 380PS S model on a circuitous route through the mountains to our hotel in Pamplona and it was fine. It’s the performance option. And it rides beautifully, even on the 20” wheels with 255/35 R20 tyres that designer Ian Callum prefers. Accepted, there weren’t many ridges and weren’t any potholes on Navarra’s excellent roads, but there were road humps in the villages and none of them came as a shock. 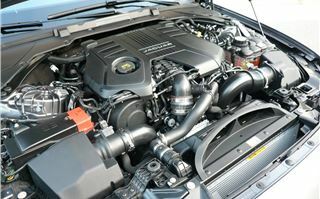 But for the same £49,945 you can also get a 3.0V6 diesel S, with 300PS and 700Nm torque. That 700Nm makes it effortless. Even left in Drive, on wide, open roads it punched up to serious speed at will. Show it some narrower tarmac and a series of hairpin bends, start paddling in ‘Sport’ (which holds the selected gears for you), and you’re in heaven. Despite the Matterhorn of torque on mountain roads, it’s not aggressive. It grips well, front and back. Tucks in faithfully if you get your line and your gear right, and, as well as that, on 19” wheels with 245/40 R19 tyres it’s also sublimely comfortable. 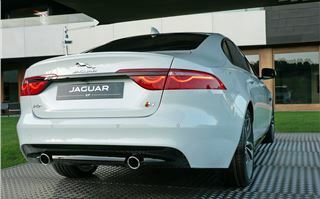 So, I have a new favourite car: The 2015 Jaguar XF 3.0d S. Realistically, it’s going to give 40 – 45mpg on the motorway, versus more like 30 - 35 from the 3.0 litre supercharged petrol S and probably 50 – 60 from the 2.0 Ingenium diesels. That makes it nearly the perfect car. 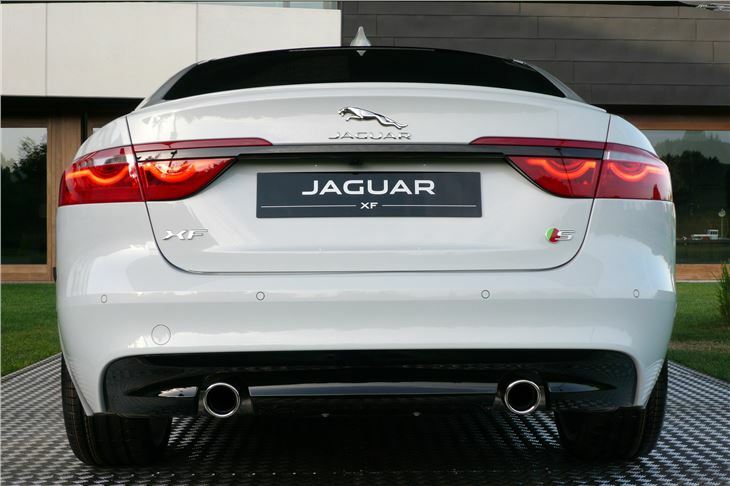 Great looking, powerful, fine handling and reasonably economical. Even though most XF company drivers will still feel obliged to plump for the 2.0 litre diesels.